And Angelus ad virginem he song...."
The psaltery (psalterion, saltere, sauterie, Psalterium, Psalter, salterio) is an ancient intstrument seen in many forms. Early versions were simply a wooden board with gut strings stretched between pegs. The strings were plucked with fingers or by plectra (the name might have derived from the Greek psallein meaning plucked with fingers). Later instruments included the hollow box or soundboard with soundholes and metal strings. The player performed with the instrument on the lap or on a table, or in front of the chest held with a strap around his neck if movement was needed. 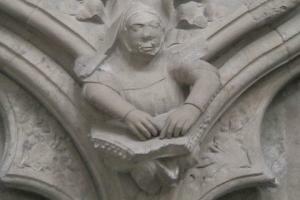 The name of psaltery entered Christian literature in the 3rd century B.C. translation of the Old Testament called the Septuagint where, in the Psalms, nebel was translated psalterion. Thus, Nebuchadnezzar's idolatrous ensemble included the Aramic psantria. Notice, also, that the book of Psalmshas also become known as the Psalter (or psalterium), from the hymns sung with this harp. 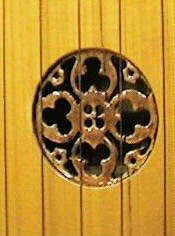 Southern Europe, influenced by Moorish Spain, prefered the trapezoidal psaltry with three or four strings to a note. Northern psalteries tended to be triangular or wing-shaped and single or double-strung. Like most other instruments of the time, the psaltery had no specific repertory, but was used to play whatever music the occasion demanded. It was referred to frequently in lists of musicians and instruments and in the art of the time. 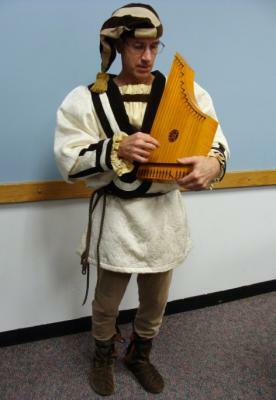 The psaltery was widely used until about 1500, but could not cope well with the chromaticism of the Renaissance, so was used less as time passed. It is thought that the psaltery evolved into the harpsichord, zither, and other instruments. 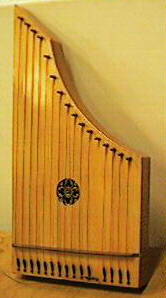 Musica Antiqua's psaltery is by Keleshek.